LONDON (Reuters) - Hundreds of flights to and from London were disrupted on Friday by a technical failure at England's main air traffic control centre that a senior government minister described as "simply unacceptable." Transport Secretary Patrick McLoughlin said he had demanded a full explanation for the glitch that forced authorities to limit access to the country's airspace at one of the busiest times of the year. Flights in and out of Heathrow, which calls itself the world's busiest international airport, were halted for at least an hour before it said operations were beginning to resume. "UK airspace has not been closed, but airspace capacity has been restricted in order to manage the situation," the National Air Traffic Service (NATS) said on its website. It later said the system had been restored, but that it would take time for operations to get back to normal. 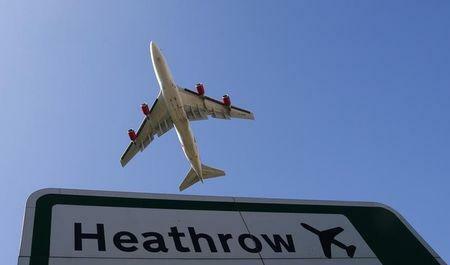 Gatwick, another major London airport south of the capital, said flights were departing but with delays. Stansted airport, the city's third busiest, said in a tweet that departing flights were also resuming. It was the second such incident involving the NATS centre at Swanwick in southern England in just over a year. Swanwick is one of NATS' two main centres. The other is at Prestwick in Scotland. Last December, thousands of travellers were delayed at major airports across England when the night operating system at Swanwick failed properly to switch over to daytime mode. NATS said it was still investigating the cause of Friday's disruption but denied media reports it had been caused by a power outage. McLoughlin said in a statement: "Any disruption to our aviation system is a matter of the utmost concern, especially at this time of year in the run up to the holiday season. "Disruption on this scale is simply unacceptable and I have asked NATS for a full explanation of this evening's incident." A government source, speaking on condition of anonymity, told Reuters the problems did not appear to be linked to any security threat to the United Kingdom. As Heathrow is a major hub for international transfers, the disruption was likely to be felt far beyond the UK. Over 67 million passengers travel through the airport annually on services offered by 90 airlines to over 180 destinations in more than 90 countries, according to its website. Airports in Birmingham and Manchester, in central and northern England, said they were unaffected by the airspace closure and were ready to accept diverted flights. British Airways said passengers who did not wish to travel on Friday could seek a full refund or postpone travel. Mikael Robertsson, co-founder of plane tracking site FlightRadar24, said it was very unusual for hundreds of flights to be diverted at the same time during the Friday afternoon travel peak. "I can't remember when I saw last something similar. For sure this will affect many thousands of travellers around Europe and the whole world," he said. One such was Canadian actor Christine Leigh waiting to take off from Heathrow with Air Canada who Tweeted after a long delay: "Oh my God, we have a departure time. If my tweets stop harassing you ... it means I'm in the air and miracles exist."